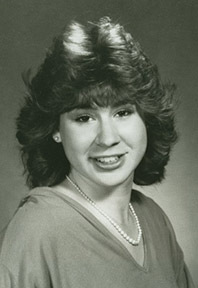 Gretchen Joyce Dater (1968-1988) was among the 270 victims of the bombing of Pan Am Flight 103 over Lockerbie, Scotland on December 21, 1988. Gretchen was a junior at the Maryland Institute of Art working toward her degree in fine arts. She had just completed a study abroad program in London through Syracuse University's Division of International Programs Abroad (DIPA). She hoped to study art education in graduate school, and wanted to teach art at the elementary-school level. Gretchen lived in Ramsey, New Jersey with her parents, Tom and Joan, and her brother, Christopher. Similar to those she hoped to teach, Gretchen showed artistic talent at a young age. During her third year of high school, Gretchen spent Saturdays at the Fashion Institute of Technology in New York City and most of one summer at the Rhode Island School of Design in Providence, Rhode Island, studying graphic and general art in preparation for her career. During her years at the Maryland Institute, College of Art in Baltimore, MD, her skill at drawing and painting increased measurably and steadily. Her last months were spent studying master works in museums and galleries in London, Paris, Amsterdam and Florence. Along the way, she visited Munich, Dachau and Salzburg where she realized her dream of visiting the setting for The Sound of Music. An acrylic painting, signed by Gretchen, was found among the wreckage of Pan Am Flight 103 in Lockerbie, Scotland. The painting, which Gretchen was never able to finish, has since been restored and framed; it shows a sky scene of London. Her mother titled it "Unfinished Business," and it has been the focal point of several art exhibitions. Gretchen is remembered for her art and, to those closest to her, her ever-present smile. Clippings contains materials the Dater family collected from newspapers and magazines on various topics including the bombing of Pan Am Flight 103, Libya, other bombings and attacks on civil aviation, as well as aviation security and safety. This series is arranged in chronological order and also by topic. Correspondence includes the written letters and cards sent to and by the Dater Family. Materials are separated by corporation or office when significant, and are otherwise filed in chronological order under general correspondence. Memorials contains the personal notes, pamphlets, programs, and other printed material from services, organizations, and places of remembrance dedicated to the victims of Pan Am Flight 103 and the Dater Family. Subject files contains papers, government documents and physical memorabilia collected by the Dater family, as it relates to the bombing of Pan Am Flight 103 and the loss of Gretchen. Trials and testimonies includes notes and official documents regarding Libya, Pan Am and related legal proceedings. TruthQuest newsletters and other materials related to the Victims of Pan Am Flight 103, Inc. have been separated and placed in the Victims of Pan Am Flight 103, Inc. Collection. United States Department of State and Fatal Accident Inquiry publications have been separated and placed in the Pan Am Flight 103 Publications Collection. Tom and Joan Dater donated the Gretchen Joyce Dater Family Papers between 2004 and 2013. Mary Kay Stratis donated memorial materials in 2016. Materials were rehoused in acid-free folders and boxes. Select clippings were photocopied. Arranged chronologically or alphabetically within series. Subject categories used by the family were maintained.